You are an Libertarian leaning Republican who loves air cooled Volkswagens, but you can't drive a Beetle or a "Hippie Bus" because you'll look like a damn communist. What if you combined the free market vibe of a Volkswagen Squareback with the redneck Republican utility of a pickup truck? You've even got a spare Ron Paul 2012 lawn sign that you can use for a rear passenger area firewall. 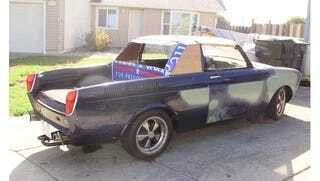 Find this 1968 Volkswagen Squarechero offered for $2,500 in Vacaville, CA via craigslist. This Squarechero roadster is powered by a highly modified 2.3 liter flat-4 that should be good for a considerable upgrade over stock power levels. The car is a total project , but at least the asking price isn't insane. The Noback sounds mean in the sellers video but the more you look, the more work you see that needs to be finished. This is a case where the wheels (if they are real Fuchs) are likely worth more than the rest of the car. Originally posted as2k: Ron Paul Revolutionary: 1968 Volkswagen Squarechero on Daily Turismo.